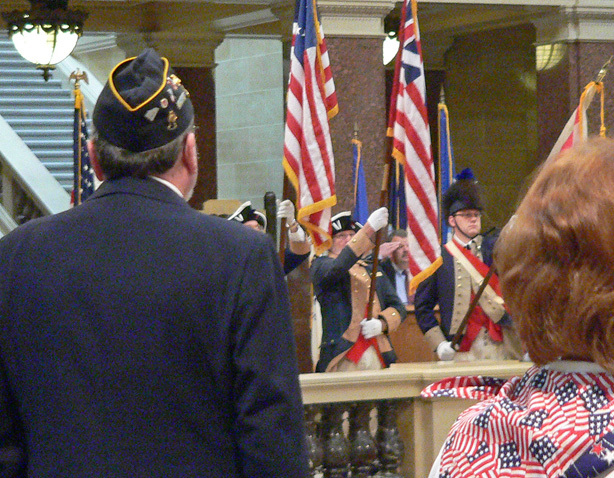 This Veterans’ Day is particularly poignant for many Wisconsin families. Governor Jim Doyle says his heart is heavy right now as he pays tribute to the victims of the Fort Hood massacre and their families. Doyle recently returned from a memorial ceremony at Fort Hood, Texas, before attending the Veterans’ Day ceremony at Wisconsin’s State Capitol. He mentions by name both soldiers from Wisconsin who were killed and the four who were injured. Doyle says Wisconsin has the finest citizen soldiers in the US. The Governor says he doesn’t like to favor veterans from any specific war or conflict, but he does give special thanks to WWII veterans. Doyle says they “saved the world,” and have contributed for years afterward to their communities throughout the Badger State.